Hobbies: Partying with friends, working out at our ranch, snowmobiling, four-wheeling, playing with my dog - Paris, playing with my cat - Johnny, and "playing with" my wife Megan! Raced Go-Karts from 1995 to 1997. Raced WISSOTA Street Stocks from 1997 to 2001. Raced WISSOTA Super Stocks from 2001 to 2005. Raced a WISSOTA Midwest Mod from 2005 to 2006. Currently racing a WISSOTA Modified (2006 to present). Grew up watching my Dad race in the '80s and early '90s. Pitted for my uncle Tim in the mid '90s. - Raced at 47 Different Tracks in 10 states & Canada. Won races at 35 different tracks. - 9-Time Wissota 100 winner. 1997 & 2001 in Street Stock. 2005 and 2006 in B-Mod. 2009, 2010, 2011, 2014, and 2016 in Modified. - Rice Lake Speedway All-Time Feature Winner with 127 career wins. 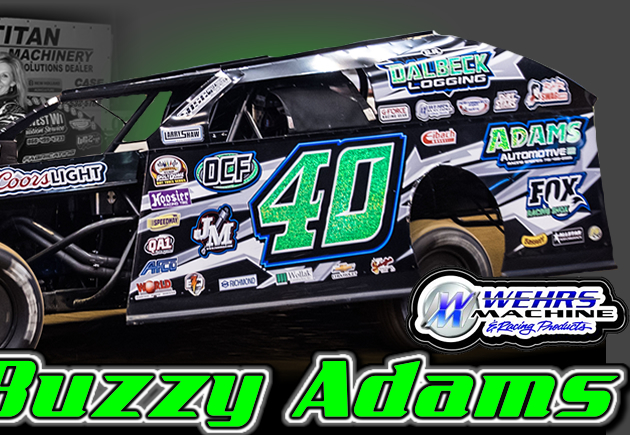 - Rice Lake Speedway All-Time Track Point Title Leader with 13. -Swept opening nights in both Mod divisions at North Florida and East Bay. • 41 Starts at 8 different tracks in 4 states. • 53 Starts at 8 different tracks • 31 top 5s. • Finished second in the $5,000-to-win Modified feature East Bay Raceway Park's Winternationals. • Finished second in WISSOTA Modified National Points. • Wisconsin WISSOTA Modified State Point Champion. • WISSOTA Modified Race of Champions Winner. • Track Champ at Rice Lake Speedway & Eagle Valley Speedway. • Season Championship feature winner at Rice Lake Speedway & Eagle Valley Speedway. • Mother's Day feature winner at Eagle Valley Speedway. • 54 Starts • 46 top 5s • 8 different tracks. • WISSOTA Modified National Point Champion. • WISSOTA 100 feature winner (#7). • WISSOTA 100 Qualifying Feature Winner. • Wisconsin WISSOTA State Point Champion. • Como Modified Series feature winner at Ogilvie Raceway. • Track Champion at Rice Lake Speedway. • Track Champion at Eagle Valley Speedway. • Season Championship feature winner a Rice Lake Speedway, Superior Speedway & Eagle Valley Speedway. • Rice Lake Labor Day Shootout Winner. • Punky Manor Challenge of Champions Winner at Red Cedar Speedway. • Tied most feature wins in a season at Rice Lake Speedway with 13. 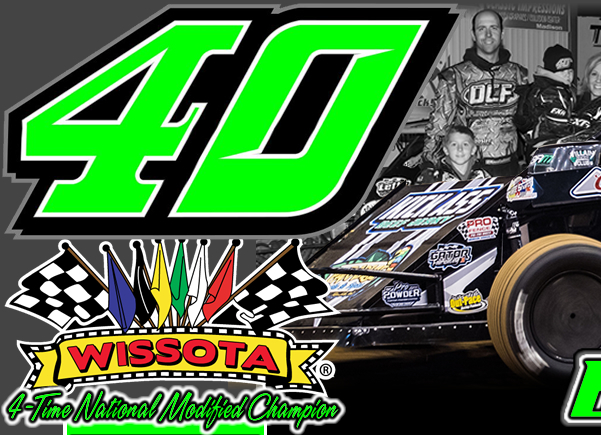 • WISSOTA 100 Champion at Dakota State Fair Speedway in Huron, SD. • Finished Second in WISSOTA National Points. • Season Champioship Feature Winner at Eagle Valley Speedway. • Lonnie Leu Memorial Feature Winner at Eagle Valley Speedway. • Kyle Ryba Memorial Feature Winner at Central WI Raceway. • Mid-season Chapionship Feature Winner at Red Cedar Speedway. • Firecracker Special Feature Winner at Rice Lake Speedway. • Father's Day Feature Winner at Eagle Valley Speedway. • Finished third in WISSOTA National Points. • Track Champion at Kopellah Speedway. • Runnerup at the Punky Manor Challenge of Champions at Red Cedar Speedway. • Kim Parsons Memorial Feature Winner at Central WI Raceway. • Labor Day Shootout Feature Winner at Rice Lake Speedway. • Mid-season Chapionship Feature Winner at Kopellah Speedway. • WISSOTA Modified National Champion! • 44 Top 5s • 49 Top 10s • 36 heat wins. • Rice Lake Speedway track Champion. • Rice Lake Speedway Season Championship Winner. • Eagle Valley Speedway Track Champion. • Eagle Valley Speedway Season Championship Winner. • Kopellah Speedway Mid Season Championship Winner. • Corn Cob Nationals Winner at Glyndon, MN. • KRA Fall Festival Winner at Wilmar, MN. • Runner Up in Western 100 at Gillette, WY. • Rice Lake Speedway Labor Day Winner at Rice Lake, WI. • Kopellah Speedway Labor Day Winner at St. Croix Falls, WI. • Open Wheel Spectacular Winner at Rice Lake Speedway. • Rice Lake Speedway Memorial Day Winner. • Firecracker Special Winner at Rice Lake Speedway. • Fourth of July Special at Kopellah Speedway. • Fathers Day Special at Eagle Valley Speedway. • Modifed Bonus Night Winner at Central WI Raceway. • Best Appearing Car Award at Rice Lake Mall Show. • Finished seventh in WISSOTA Modified National Points. • Finished fourth in the Western 100 Modified feature in Aberdeen, SD. • Won the Season Championship feature at Kopellah Speedway in Centuria, WI. • Won the Midseason Championship at Kopellah Speedway in Centuria, WI. • Placed second in Wisconsin WISSOTA Modified State Points. • Finished third in the Modified feature at the Memorial Day Shootout at Rice Lake Speedway after starting 19th. • Finished third in the Modified feature at Volusia Speedway Park on February 8 in Barberville, FL. • Finished fourth in the Modified feature at North Florida Speedway on February 3 in Lake City, FL. • Finished ninth in Florida UMP Modified DIRTcar Nationals points. • Georgia Super Bowl of Motorsports feature winner at Golden Isles Speedway in Bruswick, Georgia on February 4, 2006. • Heat race winner at Volusia Speedway Park in Barberville, Florida on February 12, 2006. • Heat race winner at East Bay Raceway Park in Gibsonton, Florida on February 17, 2006. • 2006 WISSOTA Modified National Rookie of the Year. • Finished ninth in WISSOTA Modified National Points. • Season Championship Feature Winner at Red Cedar Speedway. • Placed third at the Silver 1000 at Proctor Speedway. • Finished third in WISSOTA Midwest Modified National Points. • Earned the Wisconsin State Point Championship. • WISSOTA 100 Midwest Modified feature w inner at Rice Lake Speedway. • Eagle Valley Speedway Season Point Champion. • Red Cedar Speedway Season Point Champion. • Jim-Town Showdown Feature Winner at Eagle Valley Speedway. • Season Championship Feature Winner at Rice Lake Speedway. • Season Championship Feature Winner at Eagle Valley Speedway. • Placed third at Eagle River's Fourth of July Special. • Won Best Appearing Car award at Rice Lake Mall Show. • Finished 12th in WISSOTA Super Stock national points. • Season Champion feature race winner at Eagle Valley Speedway. • WISSOTA 100 Midwest Modified feature winner. • Finished second in WISSOTA Midwest Modified national points. • Punky Manor WISSOTA Midwest Modified feature winner. • Deer Creek Fall Jamboree WISSOTA Midwest Modified feature winner. • Monster Hall Midwest Modified invitational winner. • Rice Lake Labor Day Midwest Modified feature winner. • Rice Lake Memorial Day Midwest Modified feature winner. • Superior Jim Zembo Midwest Modified feature winner. • Midwest Modified point champion at Rice Lake Speedway. • Season championship feature race winner at Red Cedar Speedway, Rice Lake Speedway and Eagle Valley Speedway. • Kopellah Speedway Thursday Night Sizzler Midwest Modified feature winner. • Eagle River Fourth of July Midwest Modified feature winner. • Wisconsin WISSOTA Midwest Modified State Champion. • Finished third in WISSOTA Super Stock national points. • Rice Lake Speedway, Red Cedar Speedway and Eagle Valley Speedway track point champion. • Wisconsin WISSOTA Super Stock State Champion. • Season Point championship feature race winner at Eagle Valley Speedway. • IRA Sprint Car and WISSOTA Super Stock special feature winner at Cedar Lake Speedway. • Finished fourth at the WISSOTA Western 100 at Brown County Speedway. • Won the Best Appearing car award at Rice Lake Speedway. • 2003 WISSOTA Super Stock National Champion. • Wisconsin Super Stock State Champion. • Point Champion at Monster Hall Raceway and Eagle Valley Speedway. • Second in Points at KRA Speedway and Rice Lake Speedway. • Season Point Championship feature winner at Monster Hall Raceway and Rice Lake Speedway. • Mid-season feature winner at Rice Lake Speedway. • Fall Festival Champion at KRA Speedway. • Fall Special Champion at Grove Creek Raceway. • $800 Super Stock Special winner at KRA Speedway. • 45 top five finishes. • 55 top ten finishes. • 13 second place feature finishes. • Placed second in WISSOTA Super Stock National Points. • Placed seconnd in Wisconsin Super Stock State Points. • Placed second in Track Points at Rice Lake Speedway. • Received Best Appearing Car Award at the Red Clay Classic. • I-90 Challenge Champion at Sherridan Speedway in Sherridan, WY. • Feature winner at Gallitan International Speedway in Bozeman, MT. • Mid-season Champion at Eagle Valley Speedway. • Memorial Weekend Invitational Champion at Rice Lake Speedway. • Mid-summer Super Stock Classic Champion at Rice Lake Speedway. • Fire Cracker Special Champion at Rice Lake Speedway. • Placed third in the WISSOTA Race of Champions at Superior Speedway. • Placed fourth in the Super Stock Nationals at Red Cedar Speedway. • Placed 24th in WISSOTA Super Stock National Points. • Super Stock Rookie of the Year at Rice Lake Speedway. • Placed fifth in Track Points at Rice Lake Speedway. • Season Champion at Monster Hall Raceway. • Wisconsin Street Stock State Champion. • Placed third in WISSOTA Street Stock National Points. • WISSOTA 100 Champion at Cedar Lake Speedway. • 2001 Track Point Champion at Monster Hall Raceway. • 2001 Track Point Champion at Eagle Valley Raceway. • Received Best Appearing Car Award at Red Cedar Speedway Car Show. • Season Champion at KRA Speedway. • Mid-season Champion at Monster Hall Raceway. • Mid-season Champion at Dodge County Speedway. • Placed second in the Street Stock Nationals at Red Cedar Speedway. • Mid-summer Sizzler Champion at Chateau Speedway. • Labor Day Invitational Champion at Saaga International Raceway. • Fall Classic Champion at Grove Creek Speedway. • Placed second in WISSOTA Street Stock National Points. • 2000 Track Point Champion at Monster Hall Raceway. • Season Champion at Rice Lake Speedway. • Season Opener feature winner at Red Cedar Speedway. • Bud Shootout Champion at Superior Speedway. • Northern Nationals Champion at Superior Speedway. • Timberline Trucking Special Champion at Proctor Speedway. • Dale Sonnetag Memorial Race Champion at Monster Hall Raceway. • Achieved the fifth highest feature win total in WISSOTA history for one season. • 1999 Track Point Champion at Rice Lake Speedway. • Received Best Appearing Car Award at Rice Lake Speedway, Rice Lake Speedway Spring Car Show and Red Cedar Speedway Car Show. • Season Champion at RL Speedway. • Bud Watkins Memorial Race Champion at Grove Creek Speedway. • But Shootout Champion at Superior Speedway. • Mid-summer Shootout Champion at Deer Creek Speedway. • Fire Cracker Special Champion at RL Speedway. • Fourth of July Champion at Fiesta City Speedway. • Dodge County Fair Champion at Dodge County Speedway. • Placed sixth in WISSOTA Street Stock National Points. • 1998 Track Point Champion at Rice Lake Speedway. • Placed second in Track Points at Superior Speedway. • Received Hard Charger Award at Rice Lake Speedway. • Received Best Appearing Car Award at Rice Lake Speedway. • Mid-season Champion at Rice Lake Speedway. • Mid-season Champion at Superior Speedway. • Labor Day Shootout Invitational Champion at Rice Lake Speeway. • Fall Nationals Champion at Deer Creek Speedway. • Placed second in the Little Dream Race at Rice Lake Speedway. • Placed seventh in track points at Rice Lake Speedway. • WISSOTA 100 Street Stock Champion at Cedar Lake Speedway. • WISSOTA Street Stock National Rookie of the Year.